Looking for an amazing experience for the whole family? Join the Shrek's Adventure and live the DreamWorks’ masterpieces magic! 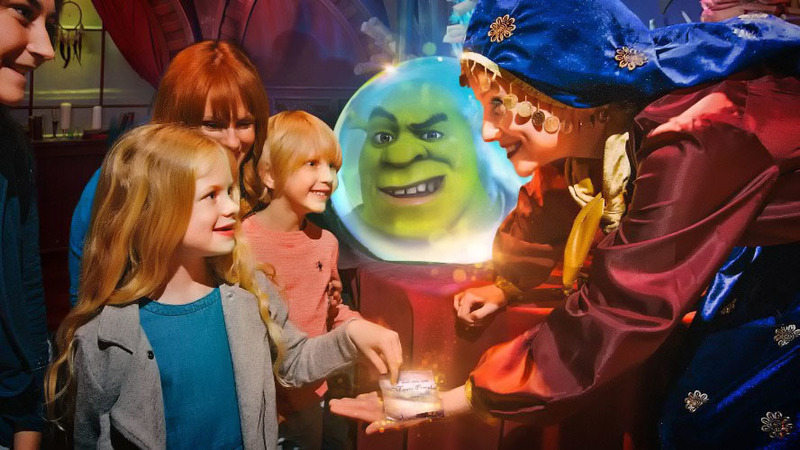 Shrek's Adventure is an interactive and immersive walk-through experience, where you and your kids can step into and live in your own hilarious misadventure with Shrek and his friends. You will start the journey on board our magical flying 4D bus to Far Far Away, the Shrek’s homeland. The 4D system will make you jump into the movie and interact with characters and the ambient with an incredible realism! You and your kids will meet Cinderella, Muffin Man, Puss in Boots and the rest of the Shrek’s cast. And it’s not over yet! After the Shrek themed tour, you will live other two Dreamwork’s classics: Madagascar and Kong Fu Panda! It doesn’t matter which one is your kid’s favorite: we have them all! Make a gift to your children: take them to this magic land and have fun together! All Children under the age of 14 years old must be accompanied by an adult 18 years or over. A tour of Shrek’s Adventure! London lasts approximately 80 minutes. Please present your voucher at the box office where you will be given an allocated entry time within 45 minutes or at a later time of your choice, subject to availability.